This section explains the options provided by Digital Media Converter to convert your files into the various media file formats. You will learn to start and stop conversions and select the right conversion options for your files. You will be able to extract audio content from video files and save them as MP3 files to listen on your MP3 player. 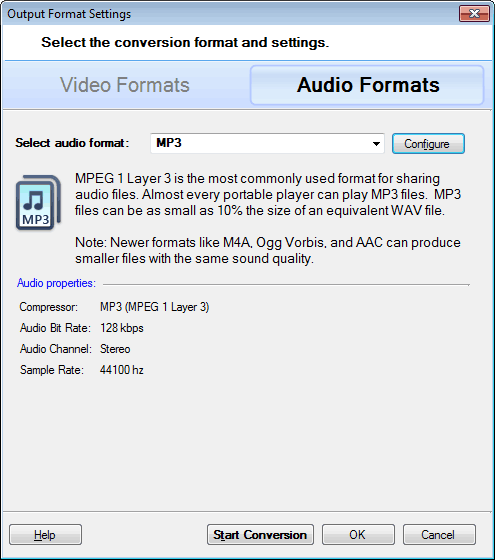 Along with MP3, other audio formats are also supported such as WMA, WAV, OGG, M4A. Select the file you want to convert from the conversion list and click File >> Start Conversion. During the conversion process, the options such as adding more files or removing files from the list and changing conversion settings are disabled. Note: The Stop Conversion option is visible when a conversion is in progress. To choose a format for conversion, click Formats menu from the Menu Bar. You can view and learn about all the formats in Output Format Settings. This section explains how to configure media properties using Digital Media Converter. The audio and video properties are set for you to achieve best results. Easily optimize the settings by keeping them similar to source file. When you select an output format, just enable the option Keep the video properties same as original. Start listening to the music from the movies by extracting audio from the videos. 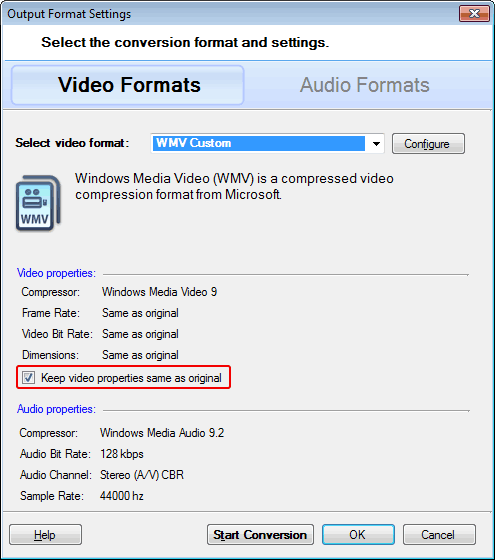 Save the audio files in MP3, WMA, or WAV format. This feature helps when you want to extract a specific song from a movie. When you finish adding the video to the list, from the Format menu, choose an audio format. The format selected depends on how you plan to use the file. For instance, if your portable audio player only plays MP3 files, then you have to select the MP3 format.